"American psychiatry, in its commitment to biological determinism, is in danger of dehumanizing the patient it is attempting to cure. To heal itself, psychiatry must change its philosophical assumptions. I believe that Brendel is absolutely right that it needs to adopt a skeptical, pragmatic, pluralistic outlook. 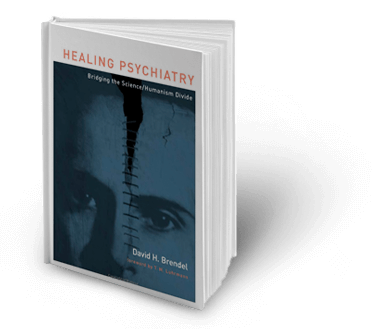 This is an important contribution to the philosophy of psychiatry." The price of a gift: An approach to receiving gifts from patients in psychiatric practice. In: Applied ethics in mental health care: An interdisciplinary reader, eds. DA Sisti, AL Caplan, H Rimon-Greenspan. Cambridge, MA: MIT Press, 2013, p. 303-20. Brendel DH, Chu J, Radden J, Leeper H, Pope HG, Samson J, Tsimprea G, Bodkin JA. Pragmatism. In: The encyclopedia of clinical psychology, eds. R Cautin, S Lilienfeld. Malden. Oxford: John Wiley and Sons, Inc., 2017 , forthcoming. Sisti DA, Brendel DH. Harvard Review of Psychiatry 2008;8:24-31. Brendel DH. Monitoring Blogs: A New Dilemma for Psychiatrists. David Brendel. "Physicians In Cyberspace: New Dilemmas For Medicine"
David Brendel. "5 Signs It's Time to Find a New Adult ADHD Treatment"